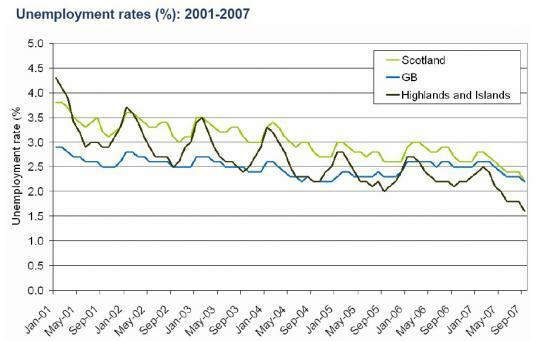 The number of people claiming unemployment benefit in Scotland decreased during the month, falling 7.5% from 77,269 to 71,504 (5,765 claimants). This figure is lower than the same period last year, where the number of claimants stood at 85,861, a decrease of 16.7 % (14,357claimants). The HIE area witnessed a decrease in its unemployment rate during the month, falling 9.7% from 4,585 to 4,138 claimants (447 claimants). This figure is lower than September last year, where the total claimants stood at 5,480, a decrease of 24.5% ,(1342claimants).